These were not just figures in history looking back at me, but guides for my own journey. Being a female pilot in 1929 came with it's own set of unique obstacles. Not only did women have to continually prove their skills, they had to defend their wardrobe since wearing pants was distinctly unfeminine. Aviation was still in its' infancy with planes basically made of wood, fabric, and an often unreliable motor. There was no GPS. No radios. Just the pilot, the roar of the motor, and the clouds in the sky. If you were lost, you landed in an open field and asked a surprised farmer for direction. The women in the derby were essentially test pilots flying in all out speed race pushing the planes, each other, and the public’s perception of what was possible. These brave contestants embodied the enthusiasm of the era while promoting a purpose bigger than themselves. They combined their passion and transferred their dreams to the world, becoming symbols of hope for a nation between two World Wars. While there certainly were cries that women shouldn't fly during this time, the story of the derby is much deeper and more significant than being female and racing. Instead of listening to those who said it couldn’t be done, these ambitious pilots chose to find a way by joining forces, collaborating, and creating a community to support the industry and each other. The fact that twenty ordinary young women could accomplish extraordinary achievements through their own convictions and passion is a lesson we can learn from today. When I found footage of the women during the race, their eyes sparkled and their essence shined. These women were literally flying outside of conventional wisdom and having fun while doing it. My hope was to capture the light the women generated and share it with others searching for their own passion. This is what inspired me to re-tell their story to a larger audience and why I felt I had to produce the film. I was looking for role models in my own journey and struggling to find a community where I could contribute any talents I may have in a meaningfully way. These pioneering pilots from nearly ninety years ago illustrated how to follow one's own inner energy to spark a community into action and forge a new path. Their contagious enthusiasm swept others into action, helping to manifest their goals, and created positive change in the world. In thinking of how to best share the story of the race behind Breaking Through The Clouds, I felt it was important to be as accurate as possible, showing how ordinary people can be extraordinary. In today’s media world, so many stories are enhanced and sensationalized for supposed dramatic effect. This story doesn’t need any sensationalizing. The courage and strength each pilot demonstrated by facing daily challenges whether it was mechanical, societal, or their own individual pressures is dramatic in its own right. Their vulnerability and “failures” is part of their charm. It is my hope that the viewer will be infected with the passion the women in the derby illustrated. Perhaps they can even help guide you in some small way as you navigate the pathways to "Breaking Through The Clouds" in your own life just as they do for me. Heather Taylor is the foremost authority on the First Women’s National Air Derby. She is the writer, producer, director, and researcher of the award-winning documentary Breaking Through the Clouds: The First Women’s National Air Derby, which is currently airing on PBS stations across the country. BTTC has won more than a dozen awards, including top honors at film festivals. Heather is also the recipient of the prestigious Combs Gates Award from the National Aviation Hall of Fame, which was presented to her by Harrison Ford, Eugene Cernan, and six additional aviation legends of today. The story of the derby was largely untold until Heather produced her film. Considered the expert on the subject, Heather has written extensively about on the women and the derby, spoken on numerous panels including at the National Air & Space Museum, and has and given presentations at Women in Aviation Conferences, AirVenture (largest air show in the world), schools, museums, and various organizations across the country. She had the honor of inducting the twenty women who flew in the First National Air Derby into the Women in Aviation’s Pioneer Hall of Fame. 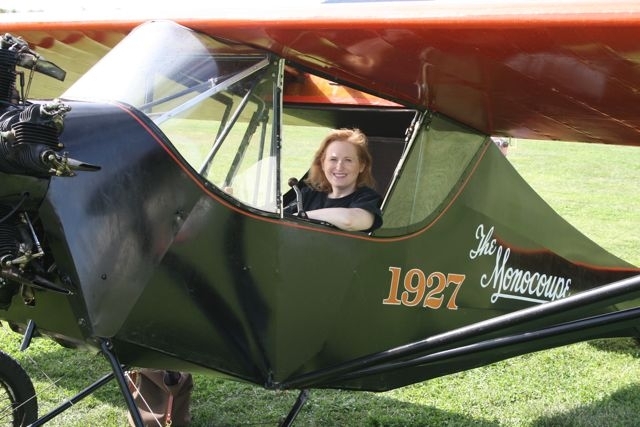 Her work is cited in several books on women in aviation. Despite growing up in a family of pilots and spending countless hours at local airports, Heather was amazed to learn as an adult that there was an entire community of female pilots who were contemporaries of Amelia Earhart. That omission of women's history set her on a new path to discover more. Following the advice of author Toni Morrison who said, "if there's a book that you want to read, but it hasn't been written yet, then you must write it," Heather gathered the courage to leave her corporate job and created her production company Archetypal Images, LLC. Part of her mission is to capture and harness the light that comes alive in peoples’ eyes when they find inspiration and through example, encourage others to seek it for themselves. The women portrayed in Breaking Through the Clouds: The First Women’s National Air Derby are perfect role models for this objective. Previous to starting her own company, Heather worked at Discovery Communications where she managed thousands of programming hours including popular shows such as The Croc Hunter, Monster Garage, Deadliest Catch, Eukanuba Tournament of Champions, American Chopper and many more. Heather has a Masters Degree in Producing Film and Video, is an alumnus of the Docs in Progress Fellowship Program and the National Museum of American History Emerging Filmmaker's Film Forum.